Some of my Areas of Impact…. Editor. (2018) Race and ethnicity research fellow discusses key EU report Being Black In Europe. ManMetLife [website] Wednesday 5th December. Available at: here. [Accessed: 5 December 2018]. Editor. (2017) UN Human Rights Meeting to be addressed by Visiting Research Fellow. ManMetLife [website] Thursday 16th November. Available at: here. [Accessed: 5 December 2018]. Gabriel, D. (2013) Race equality in academia: time to establish black studies in the UK? The Guardian [online] Thursday 25th July. Available at: here. Gouk, A. (2016) Racial inequality is still a massive problem in Greater Manchester – and these are the facts that prove it. 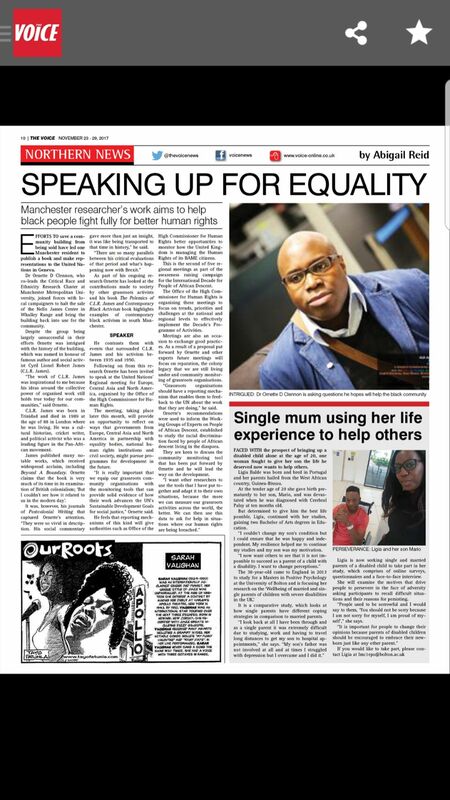 Manchester Evening News [online] Monday 12th March. Available at: here. Hollyman, G. (2013a) Raising Aspirations in Manchester Communities. ManMetLife [website] Tuesday 14th May. Available at: http://wp.me/p3b6I0-3o [Accessed: 15 May 2013]. Hollyman, G. (2011) Paving the way for new partnership working. ManMetLife [website] Tuesday 29th November. Available at: http://wp.me/p3b6I0-3t [Accessed: 15 May 2013]. Manchester Metropolitan University (2013) Diane Abbott backs Education initiative Faculty of Education News [website] Wednesday 29 May 2013 Available at: http://wp.me/p3b6I0-4C [Accessed: 30 May 2013]. Crewe Conversations: Evaluating Well-being (2012) “Hilary and Tracey (Wishing Well, 4:36)” Crewe: Manchester Metropolitan University Available at here. [Accessed: 12 Feb 2013]. Crewe Conversations: Evaluating Well-being (2012) “Mike (young session leader, 0:00)” Crewe: Manchester Metropolitan University Available at here. [Accessed: 12 Feb 2013]. Crewe Conversations: Evaluating Well-being (2012) “One of our rising stars (a participant, 4:25)” Crewe: Manchester Metropolitan University Available at here. [Accessed: 12 Feb 2013]. Crewe Conversations: Evaluating Well-being (2012) “Young People at Buzzin’ talk about their well-being (a participant, 0:20)” Crewe: Manchester Metropolitan University Available at here. [Accessed: 12 Feb 2013]. Cullen, E. (2012) Young people create musical memories of Crewe in heritage project. Crewe Chronicle, Wednesday September 12th. Available at http://wp.me/p3b6I0-3X [Accessed: 12 Feb 2013]. Dillon, L. (2010) Looked After Children and Music Making: An Evidence Review London: Youth Music Available at http://wp.me/p3b6I0-3z p.26 [Accessed: 12 Feb 2013]. Dunne, N. and Haynes, A. (2007) The Art of Looking Sideways: The role of Creative Agent in supporting School improvement. [report] Wolverhampton: Black Country Creative Partnerships. Available at http://wp.me/p3b6I0-2W p.23 [Accessed: 12 Feb 2013]. Editor. (2015) Teaming Young People up with the BBC Philharmonic. ManMetLife [website] Monday 16th November. Available at: here. [Accessed: 5 December 2018]. Editor. (2009) Cash to help pupils engage with music. Buxton Advertiser, Thursday February 19th. Available at http://wp.me/p3b6I0-40 [Accessed: 12 Feb 2013]. ENYAN (English National Youth Arts Network) (2011) ”Case Study, Sonic [db] Music Technology in Prisons” In Mendevil, J.M. (ed.). Youth Arts Transforms Lives – FACT Southampton: Artswork pp. 90 – 95 Available at: http://wp.me/p3b6I0-2P [Accessed: 10 Feb 2013]. Hollyman, G. (2013b) Halle and MMU team up to create “dubstep” music. ManMetLife [website] Friday 24th May. Available at: http://wp.me/p3b6I0-4u [Accessed: 24 May 2013]. House of Commons: Children, Schools and Families Committee (2008) Creative Partnerships and the Curriculum: Government Response to the Eleventh Report from the Education and Skills Committee, Session 2006–07: First Special Report of Session 2007–08 Available at: http://wp.me/p3b6I0-46 p.8 [Accessed: 10 Feb 2013]. Jarvie, H. (2009) Music to the Ears of Silkmore [news release] Staffordshire Police Available at: http://wp.me/p3b6I0-23 [Accessed: 12 Feb 2013]. Lee, M. (2007) HMPYOI Werrington: Sonic [db] Music Technology in Prisons [radio broadcast] BBC Radio Stoke (an inmate, 3:57) Monday July 24th Available at: http://youtu.be/65Hu7vi7Ykc [Accessed: 12 Feb 2013]. Lehikoinen, K. (2013) ”Qualification framework for artists in artistic interventions”. In Heinsius, J. and Lehikoinen, K. (eds.). Training Artists for Innovation: Competencies for New Contexts. Helsinki: Theatre Academy of the University of the Arts Helsinki ISBN 978–952–6670–05–8 (pdf) p.50 Available at: http://wp.me/p3b6I0-63 [Accessed: 16 June 2013]. May, C. (2007) Spotlight. Possibilities: Creative Partnerships East Lancashire – Renewal through creative learning, Iss. 3 p.20. Available at: http://wp.me/p3b6I0-1f [Accessed: 12 Feb 2013]. Smith, C. (2007) [Sonic [db] Co-ordinator] HMPYOI Werrington [letter about my work on Sonic [db] Project] Letter to Clennon, O. Sent 7.6.07 Available at http://wp.me/a3b6I0-lu [Accessed: 24 April 2014]. Unknown. (1996) ‘Revelation’ helps city adults look in Available at http://wp.me/p3b6I0-m [Accessed: 12 Feb 2013]. Wye, B. (2011) The Teachers’ Show: Young Musicians for Heritage Project [radio broadcast] Redshift Radio. Sunday August 28th Available at: http://youtu.be/R1opwFaDxok [Accessed: 15 September 2014]. Arntz, W. (2003) DPRP CD Reviews – 2003 – Volume 18. [online] [“Cool Water”] Available at: http://wp.me/p3b6I0-3P [Accessed: 10 Feb 2013]. Brennan, M. (2000) Dance: Tabula Rasa, Brunton Theatre, Musselburgh. The Herald, Sunday March 4th. [The Listeners] Available at: http://wp.me/p3b6I0-9 [Accessed: 13 Feb 2013]. Dibdin, T. (2000) Working in the Shadows. The Stage, Thursday March 9th. [The Listeners] Available at: http://wp.me/p3b6I0-j [Accessed: 13 Feb 2013]. Dibdin, T. (1997) Events Choice…..Divali. The Scotsman, Friday November 7th. [Divali Festival] Available at: http://wp.me/p3b6I0-6 [Accessed: 13 Feb 2013]. Mathieson, K. (1996) Emperor String Quartet, Queen’s Hall, Edinburgh. The Herald: Sunday Herald, Thursday March 21st [What has happened to all that Beauty for string quartet, soprano and live electronics] Available at: http://wp.me/p3b6I0-7c [Accessed: 20 Sept 2013]. Miller, M. (1991) Party Atmosphere. The Scotsman, Wednesday December 18th. [Hidden Song for string quartet] Available at: http://wp.me/p3b6I0-10 [Accessed: 13 Feb 2013]. Morris, D. (2000) The next fortnight sees the premieres of three new works, writes Don Morris. The Scotsman, Wednesday February 16th [The Listeners] Available at: http://wp.me/p3b6I0-w [Accessed: 13 Feb 2013]. Morton, B. (1996) Fresh, new and yet strangely familiar. Spectrum (The Scotsman), Sunday March 24th. [What has happened to all that Beauty for string quartet, soprano and live electronics] Available at: http://wp.me/p3b6I0-G [Accessed: 13 Feb 2013]. Osborne, N. (1992) A Celebration of Cultures, Glasgow 11 February – 23 April 1991. In Strugnell, S. (ed.). Scottish Chamber Orchestra Yearbook, Iss. 91/92. [Miniature I for Miniature I for chamber orchestra, soprano, mixed voices and monochord] Available at: http://wp.me/p3b6I0-b [Accessed: 13 Feb 2013]. Sykes, D. (2003) Sunday 20/07/03 Revelation, I Pinata, The Veils, Bell X1 @ Roadhouse, Manchester. Gigwise, Sunday March 27th [Revelation X] Available at: http://wp.me/p3b6I0-43 [Accessed: 10 Feb 2013]. Unknown. (1998) A heartfelt musical tribute to justice Available at http://wp.me/p3b6I0-J [Accessed: 12 Feb 2013]. Wiggins, G. (1995) One Voice: Conflict and Unity Concert Available at http://wp.me/p3b6I0-cI [Accessed: 3 Nov 2013]. Wiggins, G. (1994) One Voice: Concert for Rwanda Available at http://wp.me/p3b6I0-2i [Accessed: 12 Feb 2013].